Topics: Lodging, Dining, Shopping, Activities, Maps, and Click Here. 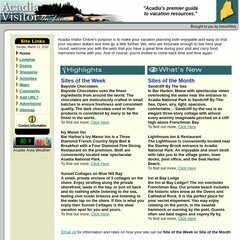 acadiaguide.com Acadia National Park Maine - Bar Harbor Maine - Northeast Harbor ..
Its IP Number is 205.178.145.89. ns74.worldnic.com, and ns73.worldnic.com are its DNS Nameservers. It is hosted by Network Solutions Llc (Virginia, Herndon,) using Apache/2 web server.